I live on the 17th floor of a building that stands out in a sea of low lying houses. When I moved in seven years ago, it was the 31st of December, right before the New Year's Eve celebrations. I remember opening a bottle of champagne in the balcony while my friends and I watched a spectacular fireworks display, care of an obviously rich neighbor. 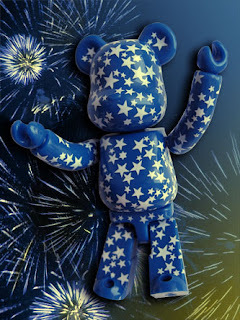 From the ground, rockets of light zoomed upwards in succession, each exploding into millions of twinkling little stars that swirled and danced – right across my balcony. It was like having front seats to a show! I will always remember how magnificent the sky looked that evening. My visual peg? 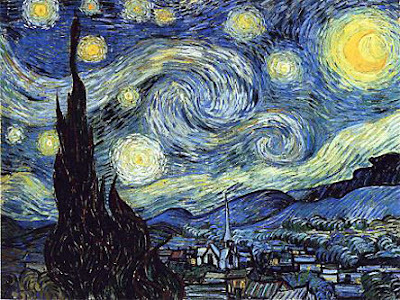 Vincent Van Gogh's 'Starry Night' (below). (Top, left) The AG Stars Bearbrick (commissioned by the Stitch Lifestyle Store in Tokyo) is based on a 1971 pattern created by Alexander Girard (1907-1993), one of the foremost textile designers of the 20th century. Aside from being an architect, interior designer, and filmmaker, Girard was a serious art collector. He and his wife amassed a remarkable collection of folk art, popular art, toys, and textiles from around the world. 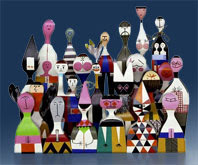 Most of them (like the wooden dolls on the right which he designed) are now part of the Girard Wing at the Museum of International Folk Art in Santa Fe, New Mexico, USA. Girard info from Wikipedia, www.r20thcentury.com, www.stitch.jp / Wooden dolls pic from Dishin' Dat.